Ever since the Find My iPhone service debuted as part of the iPhone 3.0 software in mid-2009, Apple’s iOS device location offering been a popular feature. By using your iOS device’s location—determined using GPS circuitry or wireless activity (or both)—Find My iPhone lets you locate, and even track, your iPhone, iPad, or iPod touch, via the Web or a dedicated Find My iPhone app. Assuming the device has recently been on (and, in the case of Wi-Fi-only devices, awake) and connected to a mobile or Wi-Fi network, you can actually see its location on a map, as well as send a message to it, play a sound on it, remotely lock it, or even securely erase its contents. While Find My iPhone was originally designed as a way to recover—or, worst-case scenario, erase—your iOS device if it’s lost or stolen, it’s also become popular for other uses. More than a few iPhone users who’ve misplaced their iPhone at home have used the Find My iPhone sound to reveal the phone’s location under a jacket next to the sofa. And my wife and I occasionally use the service to see each other’s progress during weekend errand runs. While originally limited to MobileMe subscribers, Find My iPhone was eventually made available to anyone with a supported iOS device who signed up for a free Apple ID. The service is now free for anyone with a free iCloud account, and now it can even find your Mac using a new feature of the newly released OS X 10.7.2 update called Find My Mac—a nice bonus for tracking your MacBook if it ever wanders off. 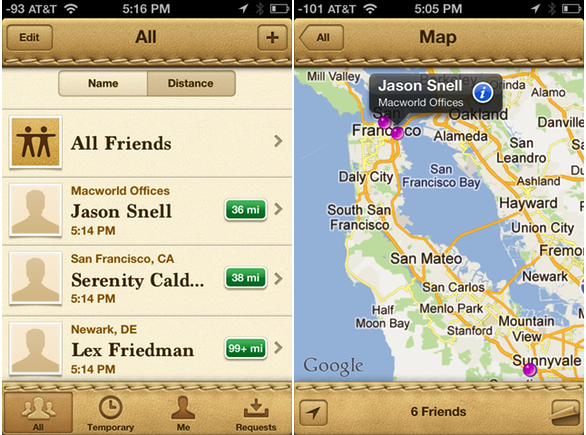 In addition, Apple has also debuted a complementary iOS-app-based service called Find My Friends. Here’s a look at setting up and using these services. If you’ve been using a MobileMe account or an Apple ID with Find My iPhone, you can continue using the service with those accounts. You can also use an existing Apple ID with Find My Friends once you’ve converted that ID to iCloud. (This happens automatically when you sign in to iCloud under iOS 5 in the Settings app, or under Lion on your Mac via the new iCloud pane of System Preferences or by visiting iCloud.com in a browser.) 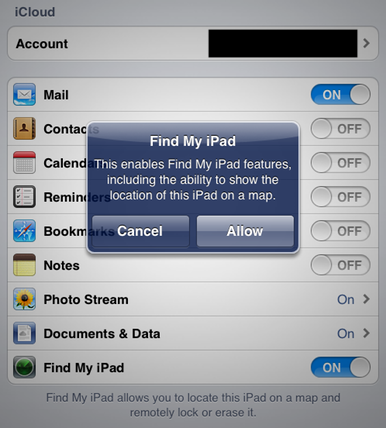 However, you won’t be able to use Find My Friends with your MobileMe ID until you migrate that MobileMe account to iCloud. If you don’t yet have an iCloud account or a MobileMe account you’ll be migrating to iCloud, you can create an iCloud account either when updating your iOS device(s) to iOS 5, or on the iCloud.com site on your Mac. iCloud requires Mac OS X 10.7.2 (Lion) and iOS 5. Once you’ve got a valid iCloud account or Apple ID, you simply use that name and password to sign in to the Find My iPhone iOS app, the Find My Friends iOS app, or the iCloud website (where you click the Find My iPhone button). 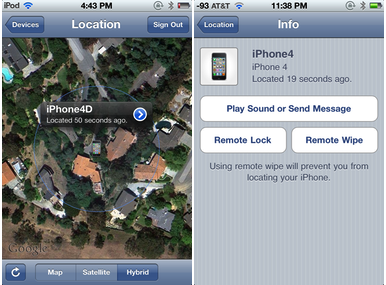 Once you’ve set up your devices, you can use the Find My iPhone iOS app or the iCloud website to find them. To use the app, launch it on any iOS device, and then sign in using your Apple or iCloud ID and password. To use the website, log in to iCloud.com and then click the Find My iPhone button. The Devices list displays every device—iPhone, iPad, iPod touch, and Mac—associated with your account (and, of course, with Find My iPhone or Find My Mac enabled). You’ll find this list in the upper left corner on the iCloud website’s Find My iPhone page, or by tapping the Devices button in the iOS app. A green dot next to a device means it was located; a red dot means it could not be found. The status of each device—how long ago it was located, or that it wasn’t located—is displayed just below its name. Tap a device to view its location on a Google map. As with the Google Maps website or app, you can zoom in our out, and you can switch between Map, Satellite, and Hybrid views. Unfortunately, you can’t track the location of a device over time—the service shows only the most-recent location. Tap the blue i button for a device, and you get several options. Play Sound Or Send Message lets you send a textual message that appears on the device’s screen, play a loud sound on the device (even if the device is muted), or both. Remote Lock locks the device, iOS or Mac, with a four-digit passcode. In the case of an iOS device, it uses your usual lock code, if you have one; otherwise, it asks you to provide one. If you opt to Remote Lock a Mac, once the Mac receives the lock command, it actually shuts down. The next time you attempt to start up the Mac, it boots into Lion Recovery and asks you to enter the passcode; if you opted to display a message, that message is displayed on the same screen. Once you’ve entered the correct passcode, the Mac reboots normally. For any of these options—Play Sound Or Send Message, Remote Lock, and Remote Wipe—you also receive a confirmation email when the message or command was received by the device. If a device associated with your Apple ID can't be found, its options screen in the Find My iPhone app or on the iCloud website gains an Email When Found toggle. Switch this to On, and the next time that device connects to the Internet, the iCloud service will send you an email noting the specific date and time the device was located (and directing you to the app or the iCloud website to perform any Find My Device actions). For anyone who, like me, has used Find My iPhone to find a spouse or other family member, iCloud’s Find My Friends feature will seem like an obvious progression. Available only using the new Find My Friends iOS app, not the iCloud website, Find My Friends uses the same technology as Find My iPhone to let you locate friends by finding their iOS device—assuming they’ve given you permission, of course. Add friends and accept requests: The first thing you’l want to do is add some friends to follow. Tap the Add (+) button; type a friend’s Apple ID or, to choose an existing contact, tap the Add Contact (+) button (you can send a request to multiple people at once); and, if you like, enter a custom message. (If you don’t enter a message, recipients will simply get a generic request.) Unfortunately, the app doesn’t provide any indication of which friends are using Find My Friends, or, for friends with multiple email addresses, which is their iCloud account. 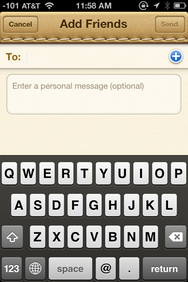 Tap Send and you’ll see a message explaining that you’ll be able to follow them after they accept your request. Once the friend has approved your request, he or she will appear in your friends list. Note that if your request is approved by your friend, that just means that you can see their location. If they want to similarly follow your location, they’ll need to send you a separate request, which you must then approve. In other words, a follow request is unidirectional, not reciprocal. Similarly, if a friend wants to follow your location, they’ll send you a request. 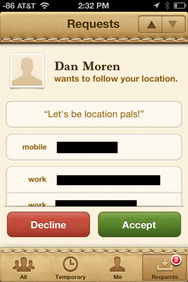 Unless you happen to be using Find My Friends when the request arrives, it will appear as an iOS notification. Tap it, or open the Find My Friends app and switch to the Requests screen, and click Accept to allow the person to follow you. If you aren’t already following them, tap the Ask To Follow button to send a reciprocal request. If you want friends to be able to send requests to one or more email addresses other than your Apple ID, you can add those addresses in your account settings at appleid.apple.com: On the Name, ID, and Email Addresses screen, just click Add Email Address. Locate your friends: You can view the locations of your friends—the people you follow—in several ways. Tap the All Friends item in the friends list, and you’ll see the aforementioned Google Mac displaying (in purple) the location of every friend currently allowing their location to be tracked; your location is displayed in blue. Tap a person’s map pin, and you’ll see their name and a description of their location. On the iPad, you’ll also see, at the bottom of the screen, detailed information such as the person’s photo (if you’ve added it to their contact), the actual address of their location, and buttons to view their contact information and directions (in the Maps app) from your location to theirs. On the iPhone or iPod touch, you can view similar details by tapping the blue i button next to the person’s name on the Find My Friends map. Alternatively, you can tap a friend’s name in your friends list to view just the location and details for that person. The friends list also displays a general name for each person’s current location (for example, a city or point of interest, or, if the location matches a location in the person’s Contacts entry, just Home or Work), as well as the distance, up to 99 miles, between you and that person. If you tap Label for a friend’s location, you can give their current location a more-useful label, such as Macworld SF Offices. (Note that the label will be displayed only at that particular location. If their location is, for example, a street number off, it won’t display your chosen label. However you view a friend’s detailed information, you can tap the Send Message button to send a text message, the FaceTime button to initiate a FaceTime connection, an email address to send an email, and so on; doing so switches to the appropriate app. Create temporary events What if you want to share your location with particular individuals temporarily? This could come in handy, for example, if you’re meeting friends for dinner, or if you’re in a group visiting an amusement park together and you want to keep track of each other. Find My Friends allows such sharing by creating a temporary event. Tap the Temporary button at the bottom of the screen and then tap Invite Friends (on a portrait-orientation iPad, hidden in the list popover—tap the list button in the upper left). 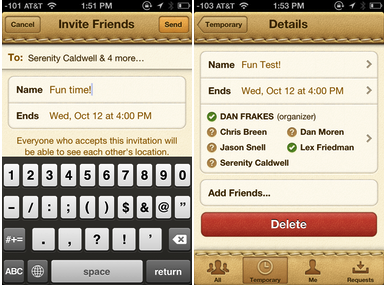 Add people to invite, give the temporary event a name, and tap the Ends field to choose a date and time for the event to end—in other words, the time at which the listed people will no longer be able to locate each other (unless, of course, some of them are following each other independent of the temporary event). Tap Send, and your invitation is sent. Note that if you send an invite to someone who isn’t already using Find My Friends, they’ll receive the invite via email, with information on downloading the app, instead of as an iOS notification. What’s unique about temporary-event invitations is that when friends accept that invitation, the location sharing is automatically multi-way—for the duration of the event, everyone can follow everyone else, without each person having to exchange two invites with every other person.